How can you be sure you are buying the company you think you are? Are you sure it is as good as the seller says? How can you be certain unexpected costs and obligations will not suddenly appear once you are the owner and responsible for them? How best can you arm yourself for the negotiations? Have you worked out precisely what you are going to do with it once it is yours? How do you set the priorities for change to recoup the premium you have paid for it? The answer to all these questions, and many more, lies with effective due diligence. Due diligence is one of the most important but least well understood aspects of the acquisition process. It is not, as many believe, a chore to be left to the accountants and lawyers. To get the best from it, due diligence has to be properly planned and professionally managed. This book is a comprehensive manual on getting due diligence right. It is a uniquely comprehensive guide, covering all aspects of the process from financial, legal and commercial due diligence right through to environmental and intellectual property due diligence. 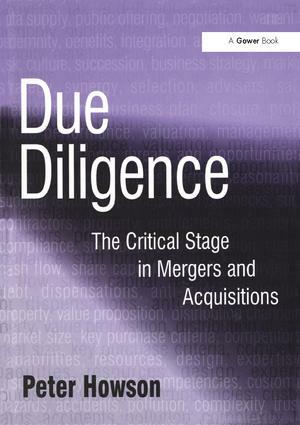 There are also useful chapters on working with advisers and managing due diligence projects. It also includes a number of checklists to help ensure that the right questions are asked.